Steve Lindsey, Vice President of Sierra Nevada’s Space Exploration Systems Space Systems, poses for a portrait Thursday, Jan. 10, 2019, at the company’s facility in Louisville. The Dream Chaser is a reusable, multi-mission space craft and will be used for transportation to and from low-Earth orbit. It is capable of transporting 12,000 pounds in the cargo module and horizontal landing on a runway. Production of a successor to NASA’s space shuttle will get underway in Colorado and will be overseen by a former U.S. Air Force pilot and astronaut who piloted two shuttle flights and commanded another three. 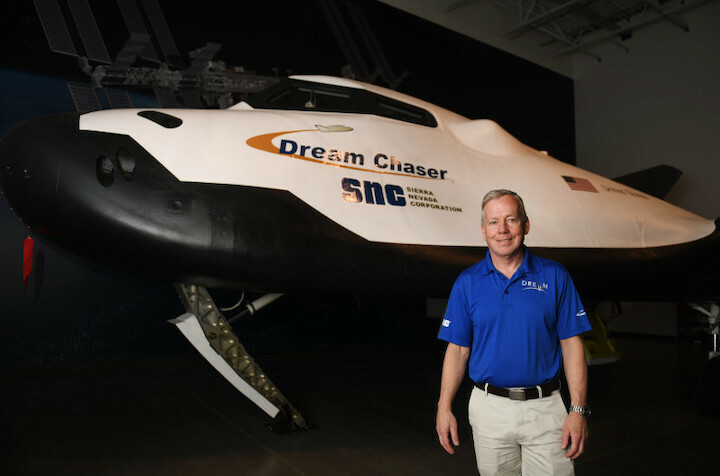 For the past few years, Steve Lindsey has overseen the design, development and testing of the Dream Chaser, a spacecraft that will be built by Sierra Nevada Corp. at its Space Systems operations in Louisville. In December, NASA declared production a “go” after the craft passed a critical review. The Dream Chaser’s first trip is scheduled for late 2020 when it will take supplies, science experiments and other cargo to the International Space Station. 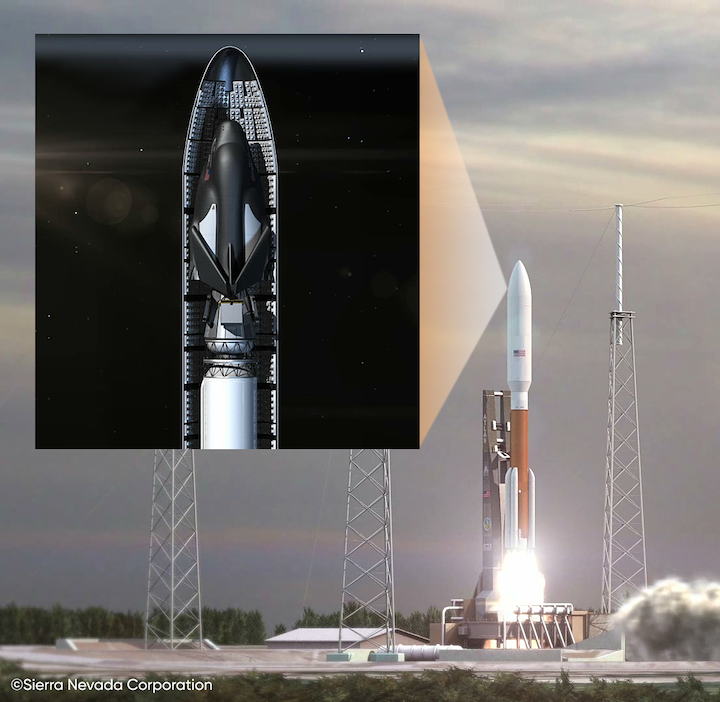 The plans are for Centennial-based United Launch Alliance to launch the craft atop an Atlas 5 rocket from Florida’s Cape Canaveral and for the craft to use the runway there on its return. There won’t be a crew. 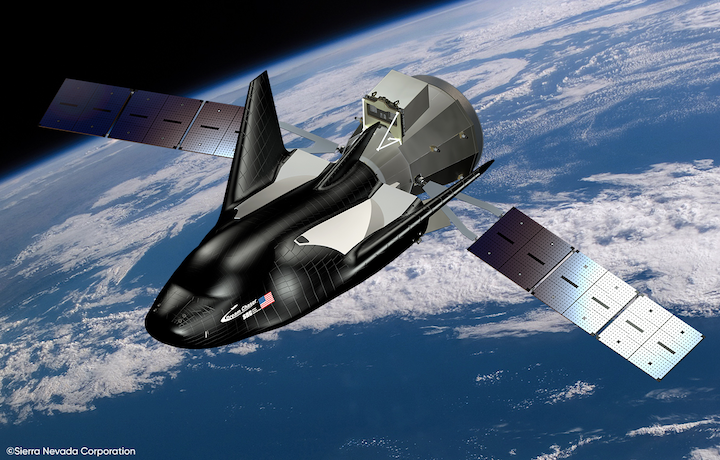 An artist’s rendering of the Dream Chaser. In 2016, NASA selected Sierra Nevada, SpaceX and Orbital ATK, later acquired by Northrop Grumman, as contractors under its Commercial Resupply Service 2 program to take supplies to the space station. Sierra Nevada’s multi-million-dollar contract is for a minimum of six missions. Sierra Nevada spokeswoman Kimberly Schwandt declined to disclose the specific financial terms of the contract awarded to Sierra Nevada, a privately run company. The Dream Chaser will be the only winged spacecraft flying to the space station, harking back to the space shuttle’s design. 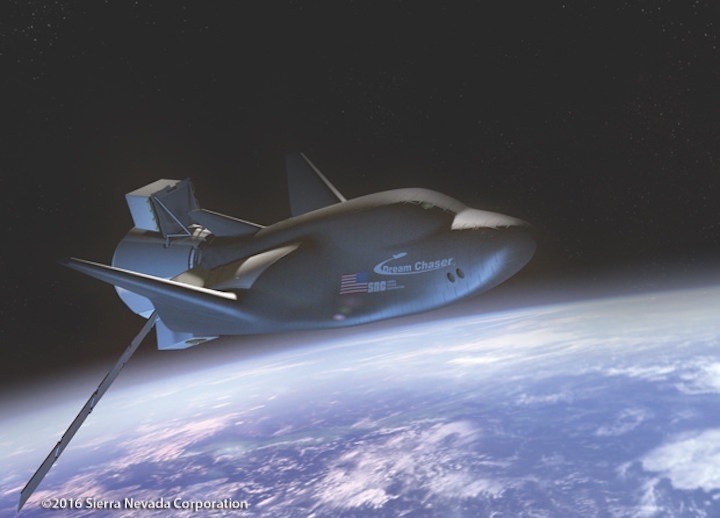 Sierra Nevada hopes to eventually send a Dream Chaser with a crew into orbit. The company has a model for that on display in a large room with all-glass walls just off the main lobby of one of its buildings in Louisville. The sleek, winged vehicle was built to carry crews and is the basis for the Dream Chaser that will launch in a couple of years. The craft is the same size as the Dream Chaser and has the same flight controls, but wasn’t designed to go into orbit. It was designed for test flights and has successfully completed the kind of runway landing the Dream Chaser will make on re-entry. 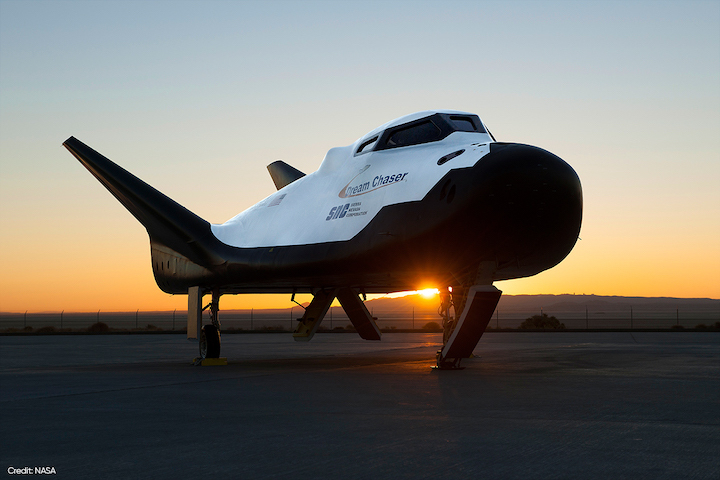 The Dream Chaser will be owned and operated by Sierra Nevada, in keeping with the public-private partnerships NASA has undertaken to deliver cargo and crews to the space station. “NASA is no longer making spacecrafts. They’re seeking out private companies as partners,” said John Roth, vice president of business development for Sierra Nevada Space Systems. Roth said the partnerships are good for the public because it should save the government billions of dollars. It’s good for private companies, he added, because they can spin off the technology and use the vehicles for other commercial ventures. Space Systems is one of the business divisions of Sierra Nevada, based in Sparks, Nev. Sierra Nevada started as a small technology company and employs more than 3,500 people across the country and in England, Germany and Turkey, who work in the areas of space, aviation, national security and defense. Sierra Nevada is expanding its 600-member workforce in Louisville. It employs more than 800 people in its Centennial office. The space program became Sierra Nevada’s second-largest division after it bought smaller space-related companies, including MicroSat Systems, which Roth headed. The smaller companies brought with them more than 30 years of experience and involvement with more than 450 space missions. The Dream Chaser will be about 30 feet long, roughly one-quarter the size of the space shuttles, which were designed with a more spacious cargo hold to accommodate parts for building the space station and the Hubble telescope. But the Dream Chaser’s design is such that it will be able to carry close to the volume the shuttle could, Lindsey said. It’s designed to carry up to roughly 12,000 pounds. And the new craft’s wings aren’t as big as the space shuttle’s. Most of the lift is created by its underside, which is wide and flat. Lindsey said a big advantage of what’s called a lifting-body spacecraft is that the “g-forces,” or gravitational forces, are much lower during re-entry than on a capsule. The craft can land on a runway rather than have to splash down in the ocean like a capsule. Re-entry at lower gravitational forces is much easier on any science experiments on board that were conducted in zero gravity, Lindsey said. Lockheed Martin is building the craft’s composite structure at a site in Fort Worth, Texas. The craft is designed to be used up to 15 times. Dream Chaser was born out of operations worthy of a spy novel. In 1982, an Australian Air Force plane snapped photos of a Soviet trawlerpulling what looked like a spacecraft out of the ocean and gave the photos to the CIA. The CIA notified NASA, which used the photos in a feat of reverse engineering to build a model of the Soviet BOR-4. From that, NASA constructed a horizontal-landing vehicle, the HL-20. The original mock-up of the HL-20 is on display at the Wings over the Rockies Air and Space Museum in Denver. NASA was going to use the craft to transport crew back and forth from the space station, but ended the effort in about 1995, Lindsey said. “The project then sat on the shelf. And then in 2006 or so, our company went and said we were interested in doing this,” Lindsey said. “We took (NASA’s) original design and did a huge amount of work on it and created what you see today, which was the Dream Chaser,” Lindsey added. Now that NASA works with the Russians in space, U.S. engineers have talked to Russian engineers about their technology that became the Dream Chaser. “They were excited that we were taking it to the next level,” Lindsey said. The work on Dream Chaser as well as Sierra Nevada’s experience with satellite systems, propulsion and environmental control systems are helping guide the design of what the company calls the Lunar Gateway.The project with NASA is intended as the beginning of lunar exploration or an outpost for long space trips, such as a mission to Mars. Lindsey’s last space trip was in 2011 on the shuttle Discovery, which also logged its last trip that mission. He was the pilot on Discovery’s 1998 trip that legendary astronaut John Glenn, at age 77, joined, making him the oldest man to fly in space. Lindsey retired in 2011 from NASA, where he had also served as chief of the astronaut corps and chief of the International Space Station operations for the astronaut office. He liked what Sierra Nevada was doing with the Dream Chaser. During his interview with Sierra Nevada, Lindsey was asked if he would be willing to fly the Dream Chaser. “I was really taken aback. I wasn’t even thinking about that,” Lindsey. “But I don’t think I will. I think somebody younger” will. Age didn’t stop John Glenn, someone reminds him. 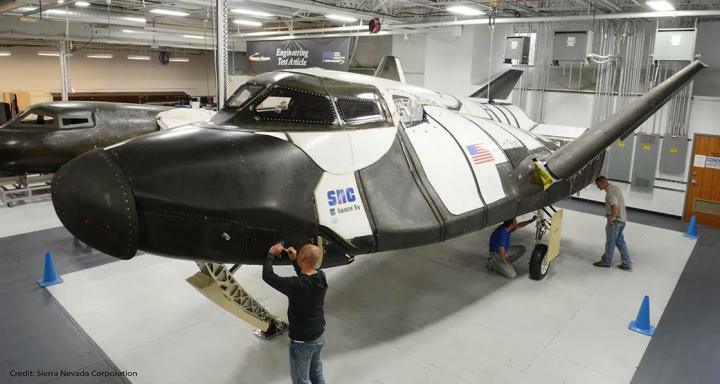 Sierra Nevada Corporation announced Thursday that its Dream Chaser spacecraft had passed the latest in a series of NASA milestone tests, likely setting the stage for the aerospace firm to launch the first of its unmanned supply missions in early 2021. Heralded as the successor to NASA's space shuttle, the Louisville-born vehicle will bring supplies, science experiments and other cargo to the International Space Station without any crew on board. After several years of design and development, the project was given the official go-ahead from NASA in December. The latest test, described in a news release as NASA's Integrated Review Milestone 5, included demonstrations of the vehicle's flight computers and software, mission simulator and mission control center. The company also was tested on its cargo capabilities using "high fidelity mock-ups of the vehicle and its cargo module, showing loading and unloading time and efficiency." In a statement, Sierra Nevada's CRS-2 Program Director John Curry said, "This milestone is a great accomplishment for the team focused on operations development and demonstration. It shows we can operate the Dream Chaser from the ground, including getting critical science in and out of the vehicle." When the spacecraft does eventually take flight, the plan is to launch it atop a rocket from Florida's Cape Canaveral and for the craft to use the facility's runway on its return. In 2016, NASA selected Sierra Nevada, SpaceX and Orbital ATK, later acquired by Northrop Grumman, as contractors under its Commercial Resupply Service 2 program to take supplies to the space station. The spacecraft is expected to make six orbiting flights to the station as part of its mission. The latest tests were conducted at the company's Louisville facility and the NASA Kennedy Space Center. "Our Dream Chaser team continues to successfully execute milestones as we move closer to getting this spacecraft into space," Fatih Ozmen, Sierra Nevada Corporation's owner and chief executive, said in a statement. "The orbital spacecraft is being built and this milestone demonstrates the vehicle keeps passing key reviews and is making great strides." The orbital vehicle for that first mission is now under construction, and the latest review, known as Integrated Review Milestone 5 (IR5), analyzed SNC’s performance of a variety of ground and flight operations, including development of the vehicle’s flight computers and software, mission simulator and Mission Control Center. 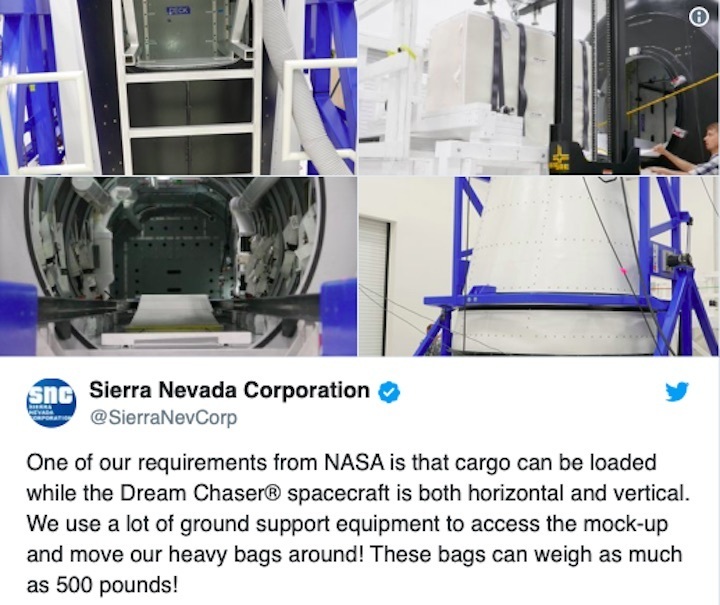 SNC also performed cargo demonstrations using high fidelity mock-ups of the vehicle and its cargo module, showing loading and unloading time and efficiency, and when all was said and done NASA declared the SNC team is on track to operate Dream Chaser in advance of the first mission. The company currently holds a multi-billion dollar Commercial Resupply Services (CRS-2) program contract with NASA to fly at least six missions to resupply the International Space Station (ISS) through the first half of the 2020s, and ultimately have their eyes set on eventual crew missions. SNC put their test article through its first free flight Approach and Landing test, ALT-1, at Armstrong Flight Research Center, CA in 2013, and the test went about as good as SNC could have hoped for, until only two of its three landing gear deployed, causing the vehicle to skid off the runway and sustain minor structural damage. The test article then conducted a Phase Two flight test campaign in 2017, which served as a bridge between previous work with NASA’s Commercial Crew Program and the latest vehicle currently under development for the cargo only missions. The second free flight test flew with orbital avionics software too, the same which the autonomous Dream Chaser CRS-2 cargo variant will use on its ISS missions. In doing so, SNC earned direct certification credit from NASA, eliminating the need for an orbital flight test before operational CRS-2 missions; all the testing and certifications happen on the ground and within the atmosphere. The testing not only aids development of the orbital cargo vehicles, but the crewed version as well. Both cargo and crew variants share an 85 percent commonality, and the cargo-version can actually be made crew ready if NASA needed it. 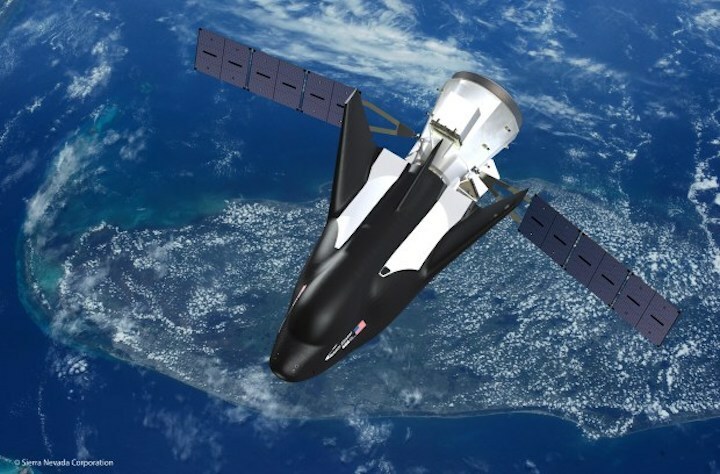 When NASA offers up another round of Commercial Crew contracts in the coming years, SNC will put in a bid for their crew-version Dream Chaser. NASA gave SNC the ‘GO’ to begin full production of the first orbital vehicle in Dec 2018, after clearing a thorough Critical Design Review; the culmination of many years of design work, analysis and development testing. Many critical parts of the orbital vehicle are already complete, built and being tested, including major structural components, thermal protection system tiles and avionics hardware, which are now being integrated into the orbital vehicle assembly at SNC’s Space Systems facilities in Louisville, CO. The spacecraft itself was actually originally designed by NASA, who did a lot of research on the vehicle in the 80′ and 90’s, based off a Russian heritage design called the Bor 4. They did thousands of hours of work on it, including wind tunnel analysis, a lot of computational fluid dynamics analysis, they conducted simulations with it, created the control laws to fly it and had a lot of astronauts come in to try it. When SNC decided to pick a vehicle they opted against a ‘clean sheet of paper’, and decided instead to use something NASA had already put a lot of effort and research into, taking the basic design and changing it slightly. NASA was looking for a spacecraft to use as a return vehicle from the ISS, so the agency competed a couple of different designs for rescuing crews in case of an emergency. One design was the X-38, the other was the HL-20 – which is now the Dream Chaser. NASA eventually decided to choose the X-38, but after working on that for several years the X-38 was abandoned also, leaving astronauts to rely exclusively on the space shuttle and Russian Soyuz. When the first Dream Chaser arrives in Florida, it will be processed at the Kennedy Space Center (KSC) Operations and Checkout Building (O&C), and will then be transported to nearby Launch Complex-41 on Cape Canaveral AFS for integration atop its ULA Atlas-V rocket, then launch with up to 5,500kg (~12,100lbs) of pressurized and unpressurized cargo. It also has the capability to dock or berth to the ISS, based on the cargo onboard and customer’s wishes (NASA). For berthing missions the vehicle will utilize a grapple fixture, and robotic trajectory analysis has already been done to ensure it would work. The spacecraft can remain at the ISS for over 200 days, before having to leave back for Earth with up to 1,850 kg (~4,000lbs) of cargo. It will also provides approximately 3,400kg (~7,400 lbs) of disposal capability each mission via the cargo module, which burns up in the atmosphere after separation from the Dream Chaser before reentry. KSC’s runway will serve as the primary landing location, for obvious reasons (next to launch site and processing facilities). However, the vehicle is capable of landing on really any runway at least 8,000 feet long, anywhere around the world, without requiring specialized equipment, and SNC has been looking into landing at commercial airports for some time, having launched their “Dream Chaser-Preferred Landing Site Program” to work with spaceports and commercial airports to become designated landing sites. With a propulsion system fueled by Nitrous Oxide and propane this also means immediate access to the spacecraft after landing, with only 10-20 minutes needed to exit the runway and keep conflicts with other aircraft using the same area to a minimum. For a nominal (planned) landing this might not mean much, but in an emergency abort (unplanned) scenario such quick access to Dream Chaser would allow other airport operations to proceed with minimal or no impact from the spacecraft’s unexpected arrival. Dream Chaser would usually take 4-6 hours from ISS departure to touchdown, however SNC has stated previously that time could be narrowed to 2 hours, if needed in the event of an emergency. Once back on the ground the vehicle will go back to the O&C, get looked over, and be readied for its next flight. Turnaround time between landing and next launch would be around 60 days, however there are a lot of other factors that go into turnaround times, such as whether or not the rocket is even ready. 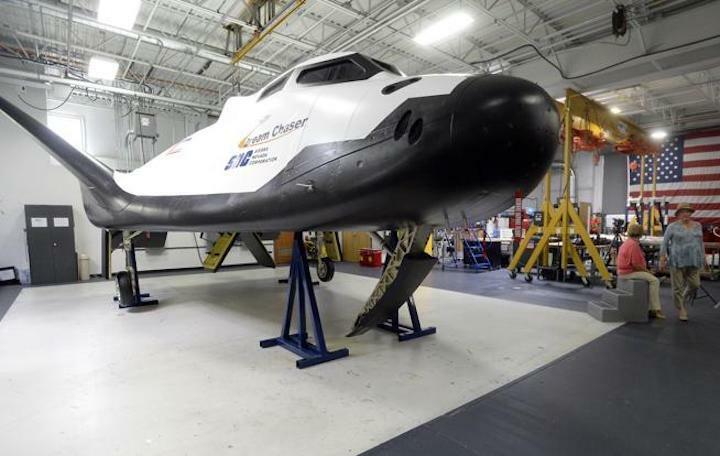 The Dream Chaser itself, says SNC, could be turned around in much less than 60 days, implying a flight rate annually of 4-6 missions per vehicle.